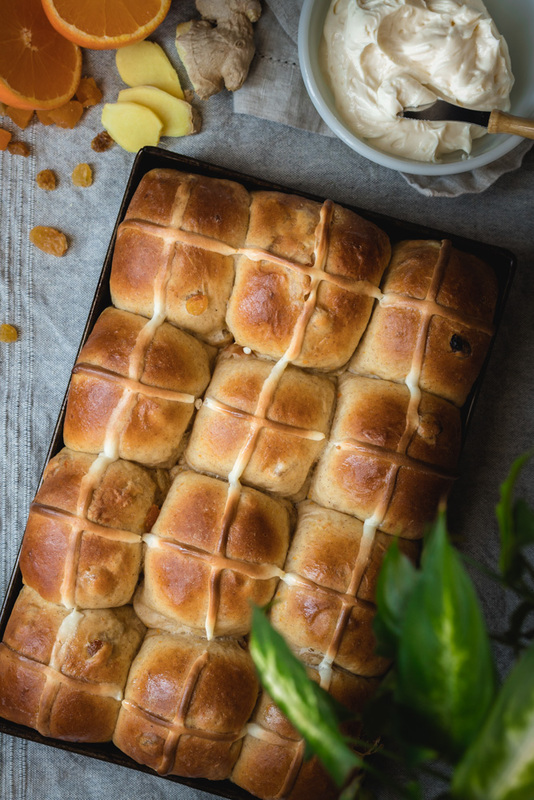 We’ve got the perfect Good Friday treat for you: Apricot Cream Cheese Hot Cross Buns. A variation on the traditional variety, this recipe nixes the raisins for apricots, as well as the sweetened flour paste for a cream cheese icing. And to compliment the apricots we added a good dose of orange zest and juice, as well as some freshly grated ginger. Yes, they are delicious. 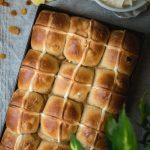 Every Good Friday when we were young, our mother used to make hot cross buns. She didn’t like the sweetened flour paste either, so her buns would get an icing sugar glaze. We decided to take them a step further with a cream cheese frosting that gets baked along with the buns. Let us tell you, it is way better than just plain powdered sugar and milk. And the raisins? Well, we were never huge fans of raisins, and we did try a version with some golden raisins, but we ended up preferring them without. So in came some dried apricots to the rescue! If you’ve never had dried apricots in baked goods you are missing out. Weigh your ingredients. If you don’t own or want to buy a scale, then when measuring the flour, fluff up the flour and spoon into your measuring cup, then level with a knife. Use an appropriate sized pan, a 9×13″ pan. The first time we made them, and what we have imaged here, were made in a 9×11″ pan. The resulting buns just weren’t quite as fluffy because they were a touch too crowded. They may seem far apart in the 9×13″ pan, but trust us it works. Resist the urge to add more flour when kneading. The dough is wet, and it takes a good bit to come together, but dough with a high hydration tends to have a more tender bite. SO when the dough is sticking to your hands and you’re like what is happening?! MUST ADD MORE FLOUR. Just don’t, or keep it very minimal. And periodically scrape the bowl to get back any stray bits and keep kneading. Everything will be fine. We use AP Flour and add vital wheat gluten. This is essentially a bread flour, but we didn’t want to store a second big bag of flour, so we opted for adding the extra gluten in ourselves, comes in a much smaller bag. If you want to use bread flour that is great! Just maybe add an additional tbsp of flour. Cream cheese should be cold when piping and use more than pictured. The first time we made it and what is imaged, didn’t have a very big pipe, so I would add more, and pipe when the icing is cold-ish. You still need it soft enough to pipe, but it won’t brown as much if it’s cold, giving you a more traditional white cross. Spread a little extra cream cheese frosting if you want – though they don’t need it! So there you have it! You will not fail, trust us. Oh, and you’ll have some leftover cream cheese frosting, but that’s not a bad thing is it? If you make one of our recipes, let us know! Comment here, on Facebook or on Instagram:) Below is a picture of what they should look like if all tips are followed (taken on my crappy phone)! 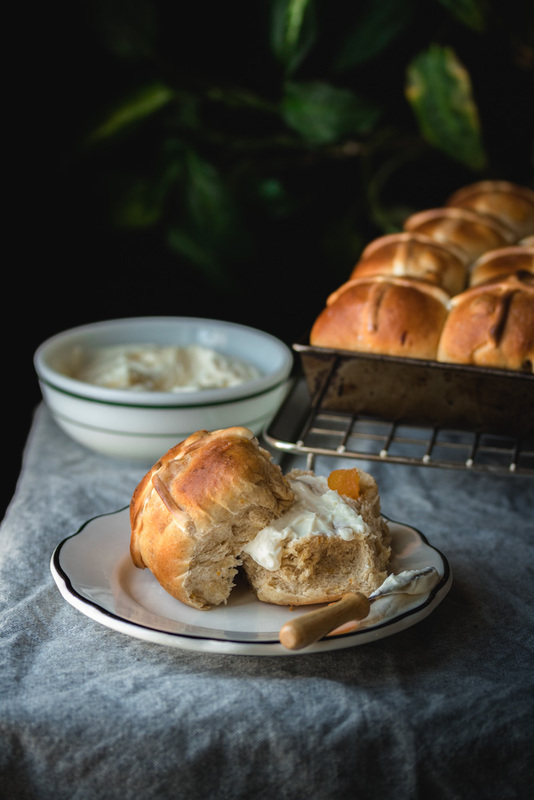 A flavourful twist on the classic bun, that is chock full of dried apricots, fresh ginger, orange juice and zest and topped with a delicious cream cheese frosting. Use 3 cups +1 tbsp Bread flour, in place of the all purpose flour and vital wheat gluten. In a small saucepan over medium heat, heat the milk until just below boiling, then remove from heat and leave to cool until warm to the touch. Stir in the yeast and set aside. In a separate small bowl, add the apricots and juice from the orange. Pop in the microwave for 30 seconds, give it a stir and set aside. Mix the flour, sugar, salt, and spices together in a large mixing bowl. add the orange zest and coat with flour breaking up clumps, then mix in well. Make a well in the center of the flour and add the yeast mixture, melted butter, grated ginger and egg. Using a fork, start to bring in flour into the wet ingredients, and stir together until a soft and sticky dough is formed. 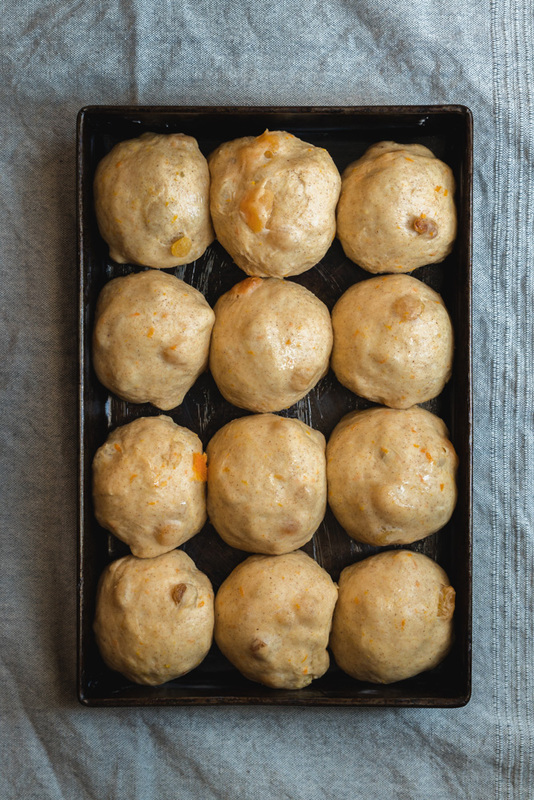 Add the apricots to the dough and begin to knead, for about 10 minutes, or until the dough comes together, and is relatively smooth. The dough will be wet, just keep kneading and it will come together. Grease the bowl with some oil, knead the dough a couple of times to get some oil on it, then form into a ball. Top with some greased parchment or wax paper, followed by a tea towel. Leave the dough to prove for one hour or until doubled in size. We use the oven to prove, as it is draft free, and we can add a bowl full of boiling water underneath for some steam. Grease a 9×13″ baking pan. Divide the dough into 12 even pieces. Roll each piece into a ball and place into the pan, leaving space between the rolls. Leave prove an additional 30 minutes to 1 hour, until doubled in size. To make the icing, beat cream cheese in a bowl with the icing sugar. Transfer to a plastic baggie and cut off the tip to pipe the crosses. Place in the fridge to cool. 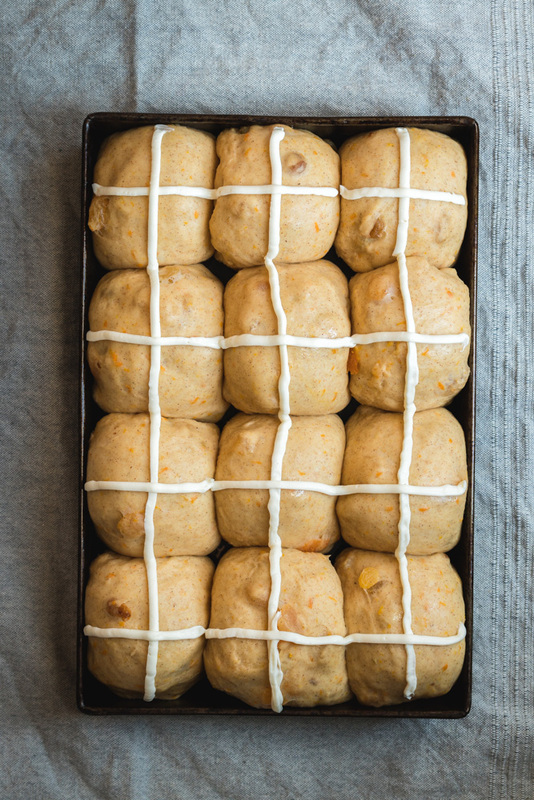 Once proving is complete, pipe a cross over the top of each bun. You may need to squeeze the bag with the cream cheese to get it workable again, the heat from your hands will be enough, but you still want it cool going in the oven, to prevent it from burning. Preheat oven to 400F. Place the buns in the oven and immediately down the heat to 375F. 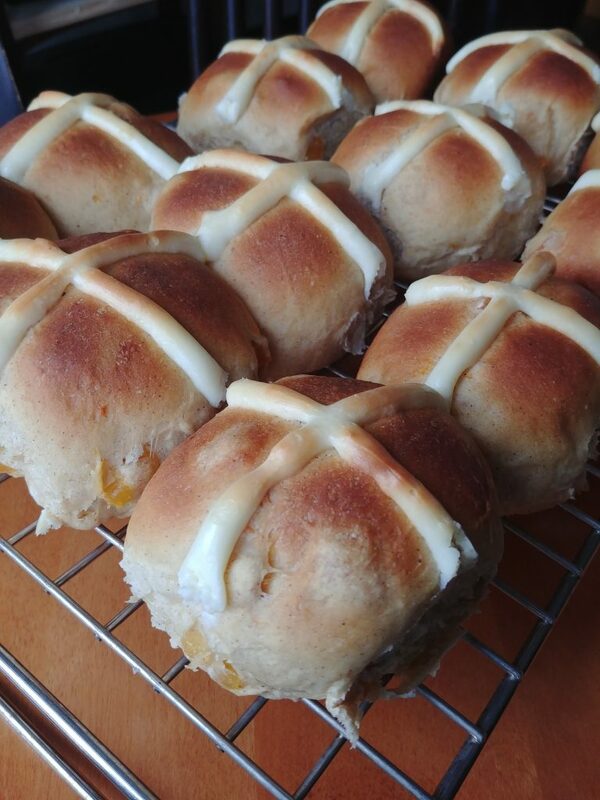 Bake the buns for 17-22 minutes or until nicely browned. Remove from the pan (a spatula works well) to a cooling rack, then brush with butter and leave to cool. Serve with additional cream cheese frosting or honey, if desired.